More than 2,000 miles of underground pipelines capable of moving millions of gallons of crude oil already cross Minnesota. The new proposal calls for construction of a 300-mile, two-foot diameter pipeline from west of Bemidji to two large refineries located southeast of the Twin Cities Metro area. 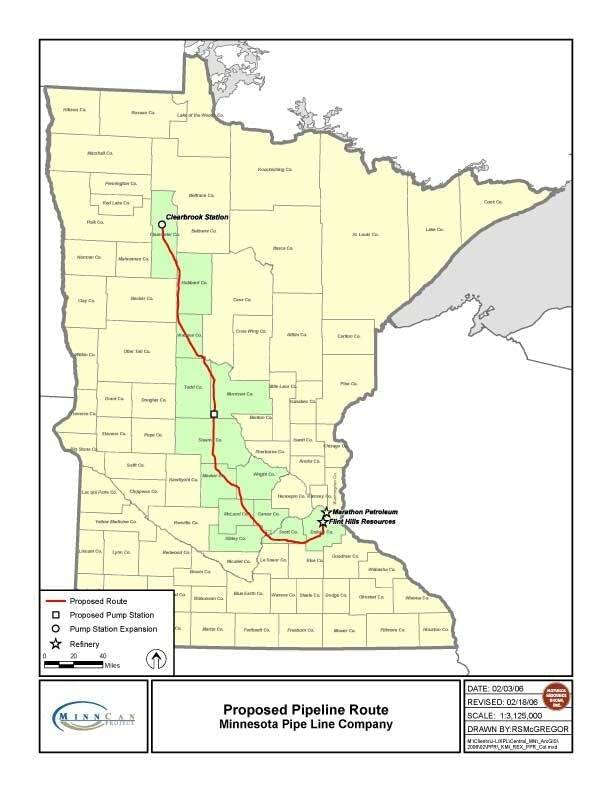 Proposed pipeline route Map courtesy of Minnesota Pipe Line Co. It's been 50 years since a pipeline of this scale has been built in Minnesota. Pipelines currently carry Canadian crude oil to the refineries in Rosemount and St. Paul Park from the same spot where the new line would originate. The new pipeline would follow the existing lines for the first 100-plus miles. It would then veer off for the remaining roughly 170 miles. Rather than following the existing lines around the eastern part of the metro area, the pipeline would skirt the western edge of the Twin Cities and run up to the refineries from the south. The right-of-way along the existing line would be expanded to accommodate the new pipeline. But all along the new route, 100 feet of new right-of-way would have to be acquired. 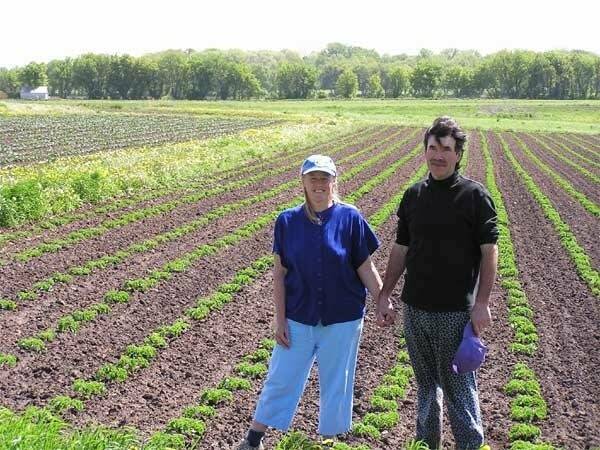 That new right-of-way would cut through the Gardens of Eagan, one of the metro area's oldest organic farming operations. On a recent spring afternoon, the owners of Gardens of Eagan, Martin and Atina Diffley confronted a pipeline survey crew on their property. They made it clear the workers were not welcome. "They're not here with our best interests in mind," said Atina Diffley. The pipeline developers say clearing rights-of-way will mean temporarily taking thousands of acres of farmland out of production. In wooded areas it will mean clearcutting a 100-foot-wide swath. The Diffleys fear the construction of the pipeline alone could threaten their hard-earned organic certification. They've engaged hundreds of their customers in a lobbying battle they hope will lead to a rerouting of the proposed line -- off their property. "Our big concern with the pipeline is after they have gone through, in a sense it would really be like an industrial site," said Atina Diffley. The Diffleys say developers are listening to their concerns, although no agreements have been reached. It's not a done deal. They are taking a gamble. Along the 300-mile route of the proposed project, there's debate about whether it's a good or a bad idea. The issue has divided the Staricka farm. 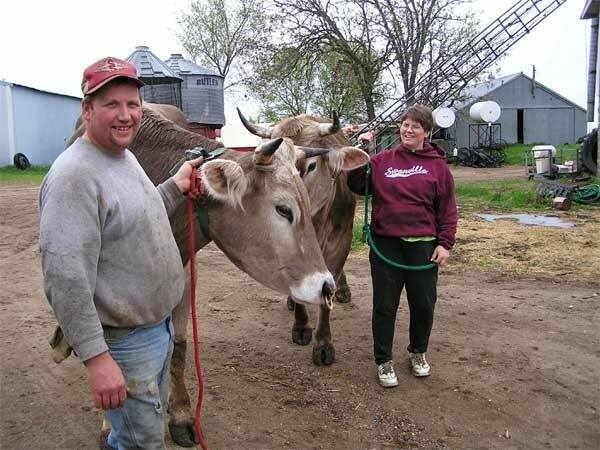 Joe and Diane Staricka milk cows about 30 miles northwest of St. Cloud. 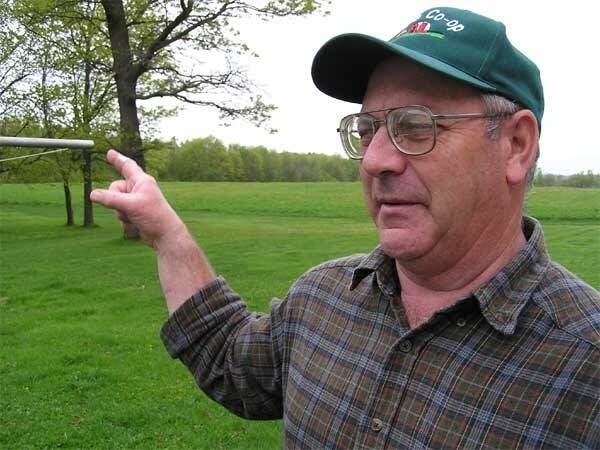 "I don't see where it's going to hurt it," said Joe Staricka. "There's pipelines all over the state and people drive over them every day. And if you're not aware of them, you wouldn't even know they're there." Diane Staricka said Joe doesn't understand the environmental implications of playing host to an oil pipeline. "My husband has an attitude of, 'So what?'" said Diane Staricka. Joe says the $5,000 the Minnesota Pipeline Company is offering him for an easement through his pasture would come in handy. He does not have environmental concerns about the prospect of millions of gallons of oil running underneath his land every day. And he's keenly aware of the need for oil the pipeline would carry. "My farm runs heavily on diesel fuel and gas," said Staricka. "I depend on it to put my crops in, to harvest my crops, to get my product to market every day. So I guess I feel that if they need the pipeline, it's something we need." Diane Staricka doesn't want her cows grazing over an oil pipeline. "If there's a leak, who's going to know it?" asked Diane Staricka. "Our milk is sold for human consumption." Many of Diane's apprehensions go well beyond her small central Minnesota farm. She's worried about global warming. Pipeline money, she says, would be better spent developing alternative, more environmentally friendly sources of energy. Even though developers don't yet have permission to build the pipeline, they've begun signing contracts with property owners, leasing portions of their land for the project. And all along the proposed corridor, representatives of the energy company have been selling the project at public meetings, promising their proposed pipeline is environmentally sound and saying it's needed. "The refineries are asking for additional crude oil," says Todd McKimmey, the project's manager. "The demand for more gasoline, jet fuel, etc. is increasing, so they need more crude oil, more supply. We have an opportunity to get it from a stable source, that being Canada. There's proven sources up there. And we're able to deliver it. Unfortunately, our existing system is not able to deliver that additional capacity, and we need that additional pipeline." 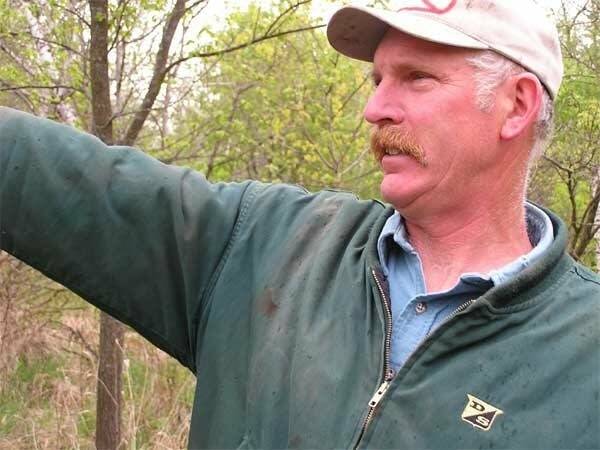 Ken Olson, who owns 40 acres of farm and woodland in central Minnesota, has already sold an easement to the Minnesota Pipe Line Co. for $2,200, and expects there will be construction crews on his property by early next summer. "I'm kind of in favor of progress," said Olson. "It's not that we don't need the oil for the fuel." A couple of farms down the road, Bruce Johnson has said "No" thus far to the pipeline representatives. Johnson says he's been planning to build a retirement home along the creek in a wooded area on his farm he calls his piece of heaven. But it's right where the pipeline is slated to go. Beyond the location problem, Johnson says he's not being offered enough money for the easement, and, like other opponents, he says he's concerned about oil leaks. "There have been spills with their pipelines in the past," said Johnson. "With anything buried in the ground, in contact with the ground, the ground is always working against the metal that's next to it. So there's always the possibility." Developers told Johnson they will realign the pipeline so that it would pass through a less desirable section of his land. But he's gotten nothing to that effect in writing, and he still thinks the price he's being offered is too low. The Minnesota Pipe Line Co. says it's already signed lease agreements with about one-fourth of the more than 1,000 property owners who will be affected by the pipeline, if the Minnesota Public Utilities Commission approves construction. The aggressive property acquisition, and plans to start and finish construction next year, have some opponents of the project suggesting regulators are poised to rubber-stamp the proposal. 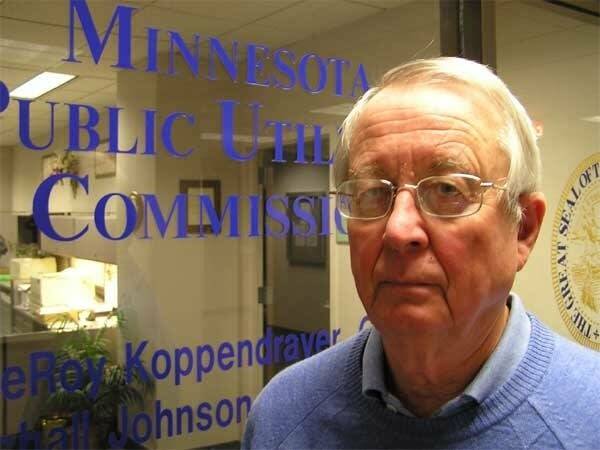 "It's not a done deal," said Ken Wolfe, who's in charge of permitting for the Minnesota Public Utilities Commission. "They are taking a gamble." Wolfe insists the project is under close scrutiny. He denies that the permitting process has been moving along under the radar. Wolfe notes that the PUC held public information meetings in each of the 13 counties which will be affected if the pipeline is approved. For the pipeline to be authorized, the PUC must determine there is a need for it, and it must approve the route based on numerous considerations -- including environmental concerns. PUC officials acknowledge the high cost of gasoline, and broader concerns about the stability of oil supplies, make this a good time to propose building a major pipeline. "I can't say that I'm in agreement with their argument," said Wolfe. "But I believe they've obviously done their homework, and have presented a pretty strong case." An administrative law judge is set to begin holding public hearings in each county that would be affected by the pipeline. The Public Utilities Commission is poised to make a decision on the permitting in November. If approved, property owners who do not voluntarily sell leases will be forced to do so through eminent domain condemnation. Developers hope to have the 300-mile pipeline ready to move oil by early 2008.